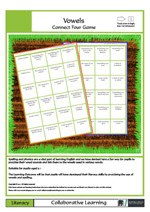 The bingo game has been devised to encourage pupils to explore the theme of growing vegetables in relation to the Giant Turnip book. The matching activity reinforces the learning of core words from the story. 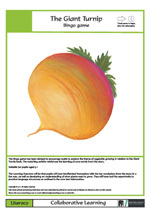 You might like to devise other ways of playing the game or substitute the vegetables with ones that pupils might be more familiar with.You can buy the Giant Turnip book in various dual language editions from the books section of this site. Learning Outcomes: Pupils will have familiarised themselves with the key vocabulary from the story in a fun way, as well as developing an understanding of what plants need to grow. They will have had the opportunity to practice language structures as outlined in the core text information. The use of apostrophes puzzles even adults, so for students learning English it can be even more confusing. 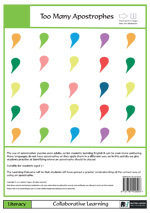 Many languages do not have apostrophes or they apply them in a different way, so in this activity we give students practise at identifying where an apostrophe should be placed. Learning Outcomes: Students will have had practicle experience in using apostrophes and gained a greater understanding of where and when they should be used. This activity gives students an opportunity to practise their mathematical vocabulary. In an enjoyable context, students are asked to draw and describe a series of geometric shapes to their partners, who then have to transform the descriptions into visual representations.Learning Outcomes: Students will be able to describe various geometric shapes. They will also have used creativity and practised their general vocabulary / communicative skills. There are many different modes of transport and this game takes, as its basis, some of the more common ones. 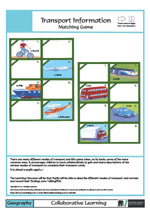 It encourages children to work collaboratively to gain and share descriptions of the various modes of transport to complete their transport cards. You may have other forms of transport that you wish to include. Learning Outcomes: Children will be able to describe different modes of transport. If you are a subscriber of the Collaborative Learning library (£110 membership with a FREE PENpal with labels and software) then you can download the pdf free of charge and print out. But frankly it is cheaper to buy the pack: all prints are made on cards, cards are sound enabled for PENpal adding an extra dimension of narration, in English and other languages, to the activity. All pictures are illustrated by artists. Game boards are laminated, Playing cards are perforated to give a square edge.The whole package not only looks highly professional, but will last much longer. Every component are stored in an accompanying sealable plastic bag.Each activity can be in other languages using shared audio files for PENpal. So, a Polish teacher or Polish speaking Buddy or a Polish EAL co-ordinator can translate key words and rules in Polish and upload their version for others to share with the FREE ShareLINK software that comes with PENpal. If you have bought the activity then you can also play in in Polish or any other language. Click here to find out more about ShareLINK. 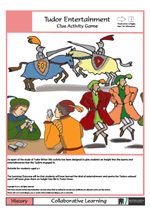 As apart of the study of Tudor Briton this activity has been designed to give students an insight into the sports and entertainments that the Tudors engaged in. If you develop your own activities around this theme please share them by sending them to the address below for expanding our library. Learning Outcomes: Students will have learned the kind of entertainment and sports the Tudors enjoyed and it will have given them an insight into life in Tudor times. 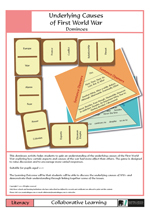 This dominoes activity helps students to gain an understanding of the underlying causes of the First World War exploring how certain aspects and causes of the war had more effect than others. The game is designed to raise discussion and to encourage more varied responses.Learning Outcomes: Students will be able to discuss the underlying causes of WW1 anddemonstrate their understanding through linking together some of the issues. In Biology, students learn about the features of amphibians, fish and mammals. Matching these animals to their various characteristics while playing a game helps to reinforce students’ learning in a fun way. 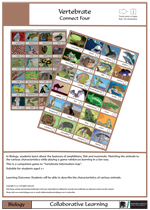 This is a companion game to “Vertebrate Information Gap”.Learning Outcomes: Students will be able to name the characteristics of various animals. 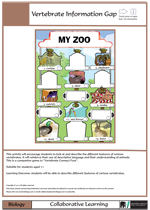 This activity will encourage students to look at and describe the different features of various vertebrates. It will reinforce their use of descriptive language and their understanding of animals. This is a companion game to “Vertebrate Connect Four”.Learning Outcomes: Students will be able to describe different features of various vertebrates. Present day working conditions for children still cause much concern. Even though this activity examines the conditions of children working in factories in the Victorian era, it is just as relevant to children working in sweatshops all over the world today. 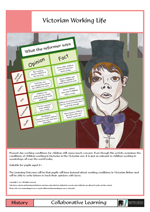 Learning Outcomes: Pupils will have learned about working conditions in Victorian Briton and will be able to write letters to back their opinions with facts. Spelling and phonics are vital in the learning of English and we have devised here a fun way for students to practise their vowel sounds and link them to the vowels used in various words. Learning Outcomes: The Learning Outcome will be that pupils will have developed their literacy skills by practising the use of vowels and spelling.